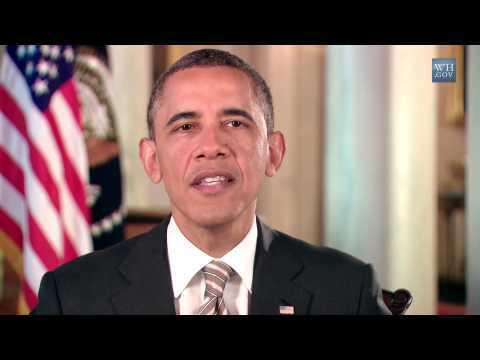 President Obama offered an Easter greeting in his weekly address. As Christians, my family and I remember the incredible sacrifice Jesus made for each and every one of us -- how He took on the sins of the world and extended the gift of salvation. And we recommit ourselves to following His example here on Earth. To loving our Lord and Savior. To loving our neighbors. And to seeing in everyone, especially "the least of these," as a child of God. That's the common humanity that binds us together. And as Americans, we're united by something else, too: faith in the ideals that lie at the heart of our founding; and the belief that, as part of something bigger than ourselves, we have a shared responsibility to look out for our fellow citizens. So this weekend, I hope we're all able to take a moment to pause and reflect. To embrace our loved ones. To give thanks for our blessings. To rededicate ourselves to interests larger than our own.